How successful are Vacuum Dehydration Units?……We recently saved a customer in the Automotive trade £60,000 worth of replacement oil costs from using our Unit for only two weeks !! Water in lubrication and hydraulic oils takes two forms; free and dissolved. Some water devices such as a coalescer filter and centrifuges only remove free water but leave the dissolved water, which can still cause substantial damage. How does dirt and water affect bearing life? Abrasive wear in hydraulic components. Reduction of lubricating properties of oil. Addictive precipitation and oil oxidation. 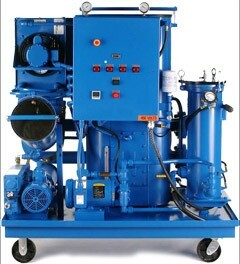 Our vacuum dehydration units remove both free and dissolved water levels to less than 25 parts per million. This will greatly extend bearing and oil life and reduce other lubrication problems. Contact us now via our enquiry form or call 0151 357 1901. Automatic operation – reduced labour costs. Compact size – easy to install and transport. Available to rent or buy – see the benefits before you buy. Contact us now or call 0151 357 1901 for a free consultation with one of our experts to see whether a Vacuum Dehydration Unit is relevant for your business.